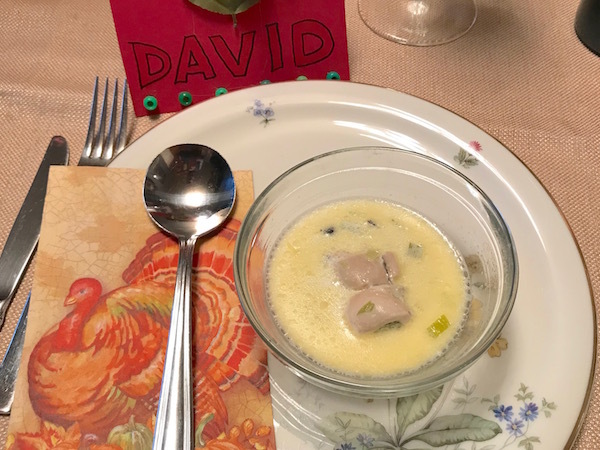 Thanksgiving Rewind 2018 | Keep It Up, David! How was your turkey day? 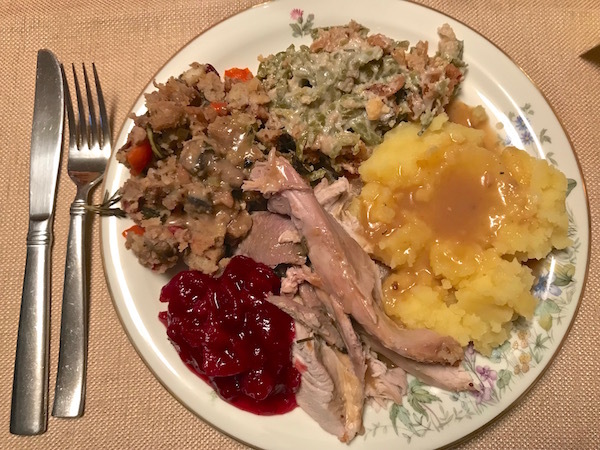 Mine was wonderful – lots of family, laughs, and great food. And abiding by the rules of my annual pledge helped guide me through the day without overeating or going into a food coma! I did break a couple rules, though, in minor ways, and I’ll get to that. But first, let’s talk Turkey Trot! One of my Thanksgiving rules is to exercise before the big meal. This year, for the sixth time, I ran the Louisville, Colorado 5K Turkey Trot. 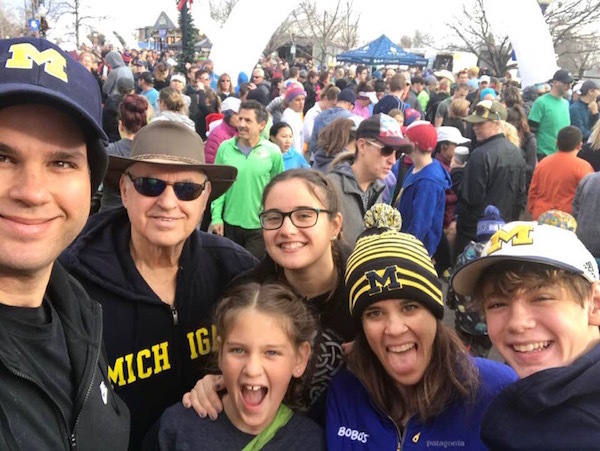 Thousands of people participate, including six members of my family: me, my father Michael, my sister Sarah, her kids Sam and Allison, and Alba, the exchange student from Spain that Sarah and her family are hosting this year. Alba and I ran the 5K (although not together), and everyone else walked – and we all had a good time. The race is untimed, although I timed myself, and I finished in 30:10. It’s my third-fastest time for this event. 2015: There was a blizzard. No time – but I ran anyway. Read about it here. After crossing the finish line, I walked backwards along the course until I found Sam and my dad, and then I walked with them until they finished. With the walking added in, I covered 4.7 miles during 64 minutes of activity. Thanksgiving workout complete! 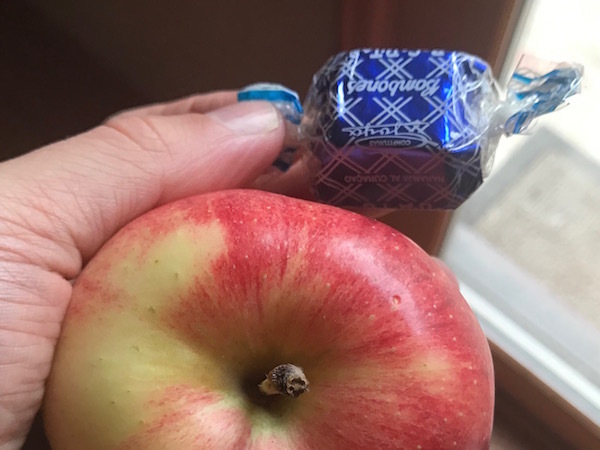 I photograph everything I eat on Thanksgiving, as a way to keep myself accountable, and my day began, before the 5K, with an apple and a single chocolate that Alba brought from Spain. 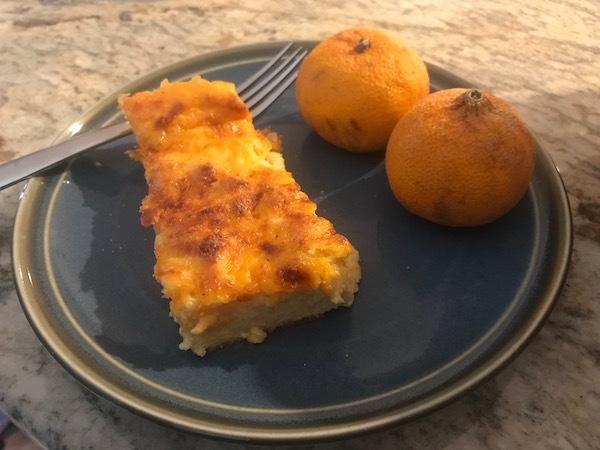 After the race, I had a piece of egg casserole (which is basically egg, bread, cheese, cream, and milk) and two clementines. 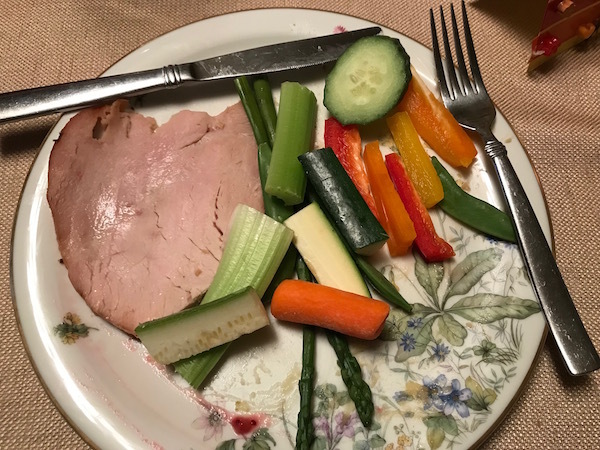 My brother-in-law Justin cooks Thanksgiving dinner – and does an amazing job – and my big contribution is a veggie platter that we can munch on as an appetizer. Gobble gobble! The dip in the middle is a store-bought jalapeno cheddar dip. 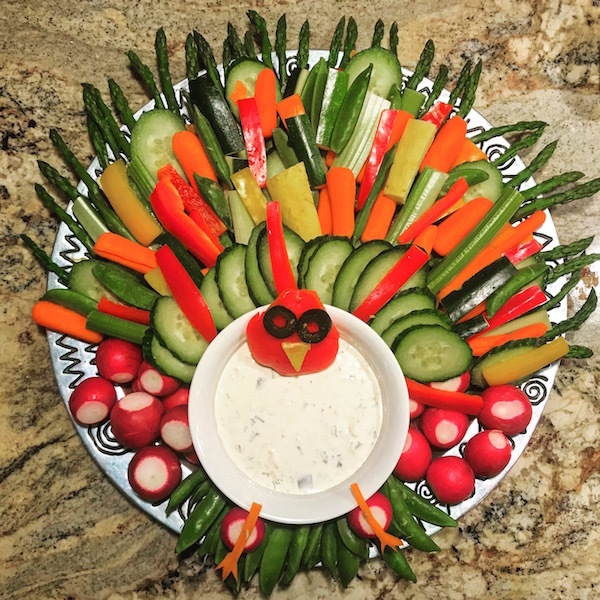 One of my thanksgiving rules is not to graze and put everything I want to eat on a plate, but I broke that rule with this veggie platter, because… raw veggies. I dipped about eight pieces in the dip, and then ate tons more without dip. Our actual Thanksgiving dinner began with a small bowl of oyster soup, a tradition in Justin’s family. Then the main course! Turkey (white and dark meat), mashed potatoes, gravy, stuffing, green bean casserole, and cranberry sauce. I don’t eat seconds on Thanksgiving, but there was also a smoked turkey from a local barbecue restaurant that I missed when I put together my plate, so I went back and got a piece of that, which technically isn’t seconds if I didn’t have it before. Loophole! I also grabbed some veggies off the platter. I broke another rule while we were cleaning up. I’m not supposed to graze, but I picked a few more small pieces off the turkey platter while we were clearing the table. I didn’t photograph it. 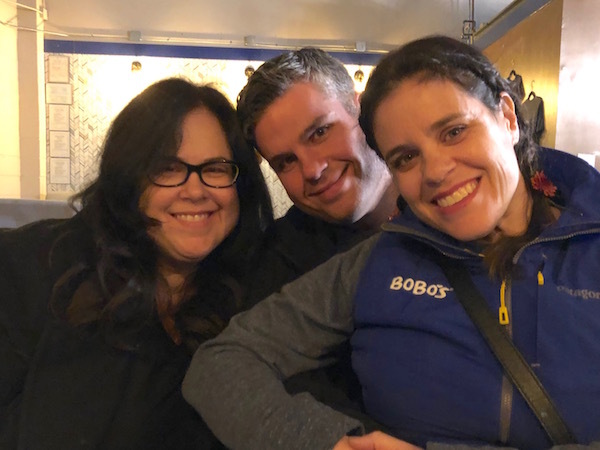 Later that evening, we went to Burns Family Artisan Ales, an awesome brewery in Denver that my cousin Laura opened with her husband Wayne. 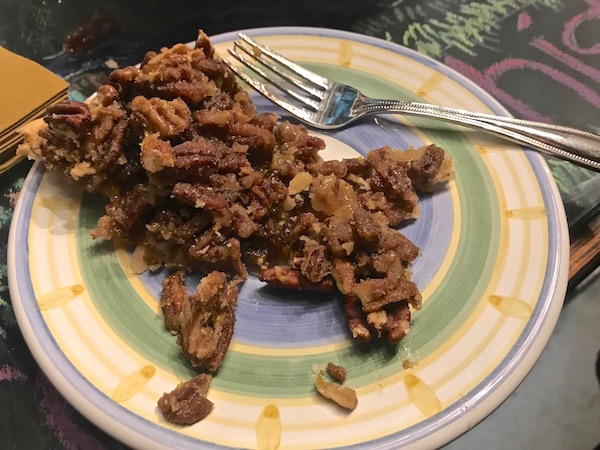 I sampled a bunch of beers (probably amounting to a few tablespoons total), and had a piece of delicious homemade pecan pie that was brought in by another customer. 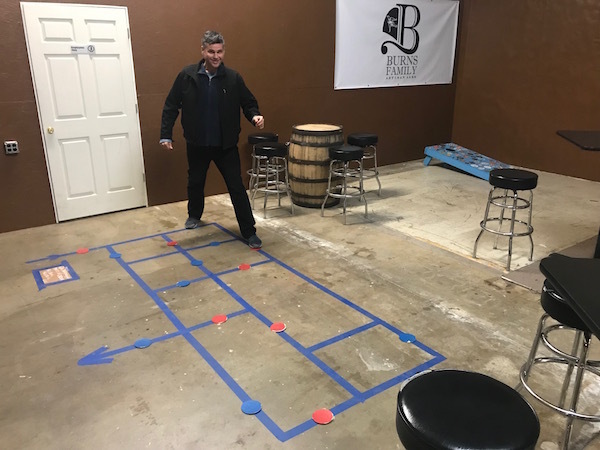 It’s a great place, and they have a bunch of games – including some you can play to possibly win discounts on your tab – and there’s a clever, tricky maze on the floor that I couldn’t resist trying to solve. Mostly, though, it was more quality time with family, and that’s what Thanksgiving is all about! I have a few more posts about this trip to Colorado coming soon. I drove from Los Angeles to Colorado with JJ, and I have a road trip post in the works, plus more adventures, with lots of miles covered on foot and JJ’s first romp in the snow! As I put another Thanksgiving behind me, I remain thankful for all the love in my life, and I am grateful for my health, and my ability to stay on top of it, year after year. I’m ready for the holiday season, and am determined to start the new year lighter than I am right now. No holiday weight gain for me! Follow me! I’m @keepitupdavid on Facebook, Instagram, Twitter, and I’m on Google+ too! There’s also a “Sign Me Up” box on this page (at the top of the right-hand column) where you can subscribe to receive new posts via email! This entry was posted on Sunday, November 25th, 2018 at 6:36 pm and is filed under Uncategorized. You can follow any responses to this entry through the RSS 2.0 feed. You can leave a response, or trackback from your own site.